A spectacular trade exhibition for food and beverage business owners and hotels, specialise in culinary, services, marketing, restaurant design and technology. We invite you to encounter real experiences and exchange tons of knowledge in HORECA business with Gurus and professional restaurant owners. 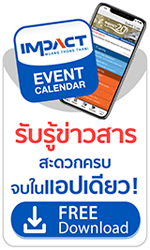 Thailand's biggest travel fair at IMPACT "Thai Tiew Thai#49th" features exclusive offers and promotions from Thailand's best tours, hotels, airlines, spas, cruises, car rentals, travel gears and much more. “BEEHIVE Lifestyle Mall”, the first ever lifestyle mall on Bond Street, located in the heart of Muang Thong Thani, is celebrating its fourth anniversary and success. Check-in and shop till you drop, various food and drink, fashion clothes and accessories, DIY, home decoration, 2nd Hand and handmade goods. Enjoy your shopping experience with your family. November 01-02, 2018 Time: 17:00-22:00 hrs. November 03-04, 2018 Time: 12:00-22:00 hrs. 80% Special Discount from over 200 brands in many catagories like fashions, perfumes, home decorations and electronics with many promotions. Gindee Yoodee by cheewajit offers healthy products including healthy food & drink, fruits, vegetables, and Thai rice. The highlight is exercise activity to balance your body and soul.